So where do we start? 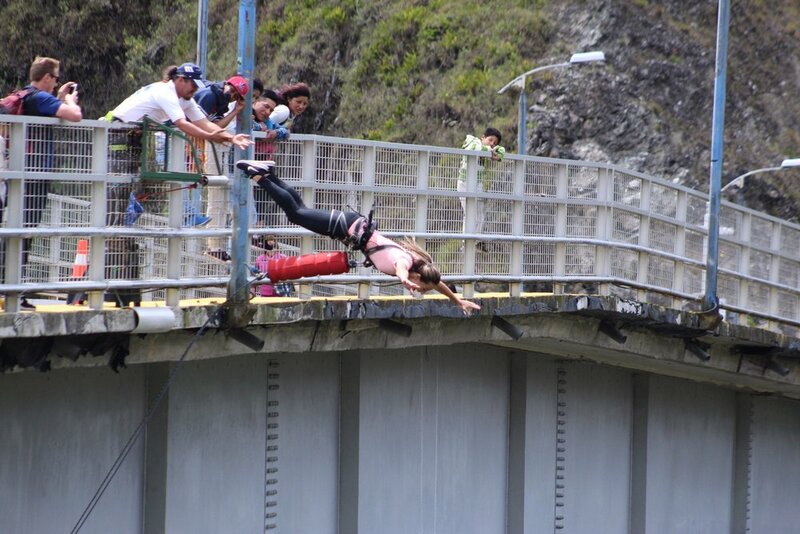 We spent an amazing 4 fun-filled action packed days in Baños, Ecuador. The first thing we did after checking into our hostal when we got into town was find an amazing tour company. There are so many to choose from that you could have your pick of any. After comparing prices and reading reviews we went with Imagine Ecuador whose helpful owner Juan was the icing on the cake. The first day we chose to do Canyoning where you get to cliff jump and repel down huge waterfalls. Repelling down waterfalls was something neither of us have done but couldn’t wait to try. It was the perfect activity to get our adrenaline pumping. We showed up at 9am where we were outfitted from head to toe- helmet, full wet suit and water shoes. To say we looked styling is an understatement! From there four of us newbies and two guides loaded onto the bus for a 30 min ride up to the cliffs. As soon as we got out of the vehicle the rain started pouring down, big heavy droplets. We all looked at each other like this was some sort of test that we had to pass before actually getting into the good stuff. They had us practice how to properly position ourselves to repel down a Cliffside and had us doing flips by the end of the practice round (kidding). When we were given the passing grade we started our adventure into the waterfalls. First thing was easy, we had to jump off of a 3 Meter cliff- easy! Then we built up to the 5 Meter and then came the 7 Meter. For anyone who knows me, I am not a fan of cliff jumping, it scares the daylights out of me and this was no exception, especially when there’s a fairly aggressive waterfall right beside you. I will bungee jump and skydive but something about cliff jumping just doesn’t sit well with me but in a group setting when everyone else is going I close my eyes and jump. Once we were through jumping down the smaller waterfalls it was time to test out our skills at repelling. The guides would hook you up and then you’d make your way down, finding all the nooks and crannies and basically walking your way down the cliff, it made us feel like Spider-Man (or woman). It’s a pretty unbelievable feeling to be scaling down the side of a cliff right beside a huge cascading waterfall. It made me laugh when one of the guides who was getting me all strapped in asked me to step on his “feet fingers” to properly position myself. Sometimes the language barrier can be quite comedic. We spent a solid 2 hours in the canyon on a constant high from the adrenaline that was pumping through our bodies. It’s amazing how much energy you exert jumping, climbing and repelling down because we were exhausted by the end of the day. Lucky for us we stopped at a traditional Ecuadorian place for lunch to fuel up our hungry bodies before returning back to our hostal. Side note: As Piet was getting ready my one job was to take a video of him jumping his first jump and so as I was ready to film, the video (or me) stopped and I literally missed the WHOLE jump. I managed to get a picture of the rope and that’s it. I was so focused on watching him jump that I completely missed doing my job and funny thing is we joked that I would probably miss it on camera (talk aboutbad omen). Lucky for me there’s always someone around with a camera and someone with a much better attention for detail who managed to get his whole jump.. phewf! Our third day was a lot less action packed, honestly because our bodies probably couldn’t handle too much more without rest. So we chose to head up to Casa Del Arbol- labelled “the swing at the end of the world”. The swing is located 2600 meters above sea level on the side of a cliff and with views of the Tungurahua Volcano (possibly erupting) what more could you ask for? This has been on my list of things we must do in South America. Well we left sunny Baños and rode the 40 minute bus ride up the hill and as we neared the top, much to my dismay, a level of fog kept creeping in. Fog is fairly common in this area of Ecuador, surrounded by the mountains, so it’s truly hit or miss what kind of weather you get. Well we were in fog, totally surrounded by it by the time we reached the swing. You couldn’t see the below the cliff, you couldn’t see too far in front of you- yes a slight disappointment but what we’ve learned with traveling is it won’t always go as planned. We try and keep our expectations in check because you never know if something will be closed, or how the weather will be or there’s a huge chunk of scaffolding covering what you came to see. You just never know so we try and make the best of what we are given. So I lined up for my turn on the swing (yep it’s a huge tourist attraction this swing but I still wanted my turn). As you sit yourself down on the small wood piece and they “seat belt” you in with a bungee cord you have time to think “am I sure this is such a great idea” and then you are off- soaring high above the trees and clouds (or into the clouds depending on the day). Although we didn’t exactly get the view we had hoped for it was still worth an afternoon trip to get that feeling as if you were flying. On our last day in Banos we decided to visit the Pailion Del Diablo (Devils Cauldron) which is one of the largest waterfalls in Ecuador. We had the option to bike, go-kart, 4x4 or bus up to the waterfall which is located in a nearby town about 40 min drive from Baños. We chose to bus given that it was already raining outside and still a little sore. So we walked down and then back up to the waterfall, and the power of the waterfall is pretty outstanding. From every look-out point you are getting wet. You can even take this very small and crowded and slightly claustrophobic little tunnel to lead you back behind the waterfall. We didn’t make it that far because people who did it were coming down drenched, soaked head to toe, and we were already a little chilly. After we came back from the waterfall, we had the most delicious empanadas to date! This very friendly woman runs a small roadside “restaurant” (I use the term restaurant very loosely here) just right around the entrance to the waterfalls. We tried 4 different kinds and they were so good, the filling was delicious and the outside dough was flaky and light. A perfect lunch to help fill our bellies after all the walking. After 4 long adrenaline pumping days we needed to give our bodies some much needed Rest & Relaxation and decided we wanted to spoil ourselves so we checked into La Casona De La Ronda in Quito. Quito is a almost a central hub for stop overs while adventuring Ecuador because of its location and transit that moves through it. This charming heritage boutique hotel is located in the historical center of the old city of Quito and a perfect place to unwind. From the friendly staff that wanted you to feel as if it was your home to the welcome drinks upon our arrival to the daily tea and coffee (and delicious cookies) we felt like it was a great home-away from home stay. This place was the whole package for someone wanting to experience what life in Ecuador was like many years ago. As some of you may know, Quito is one of the most well preserved Spanish influenced cities in South America and it shows at this hotel. Built in 1738, a UNESCO heritage building, you could feel the rooms and building oozing history. The amount of detail and daily maintenance done on this hotel was definitely showcased by its allure and charm. When talking to the manager Maria she told us the building is like a lady. As a lady gets older, it takes a little more effort and upkeep to showcase its beauty. My personal favourite was the winding staircase up to the loft over-looking parts of the city and Piet’s favourite was the old rock wall leading into the restaurant where one of the most delicious breakfasts was served. Now that we’ve been able to catch-up on our sleep we are ready to hit the road again.